Floyd Mayweather, victorious for the 45th time in his professional career, stood surrounded by his entourage post fight as he was interviewed by legendary sportscaster, Jim Gray. Mayweather, having defeated Saul “Canelo” Alvarez in one of the highest profile fights in history further strengthened an impressive legacy that will see him go down as one of the greatest fighters ever. When Gray asked Mayweather about his plans going forward, Mayweather’s “Money Team” entourage started up shouts of “TBE, baby, TBE”. Mayweather, himself decked out in his own clothing brand, wore a cap bearing the same initials. Like all great fighters, Mayweather has an unerring confidence in his own ability, and undoubtedly perceives himself to be TBE: The Best Ever. It’s now for everyone else to decide where he places in the pantheon of Boxing greats. In the lead up to the fight, there was a lot of discussion in the press about the state of boxing. For a number of years now the health and popularity of the sport has been discussed and debated. Boxing has risked becoming stale as fights are often hand picked as easy fights for the better fighters, rendering some of the sport’s landmark weight divisions uncompetitive. There is also the issue of the number of titles that are available within a division. Due to the various governing bodies within the sport it is common for there to be 4 to 5 world titles within a division. This of course devalues the notion of a World Champion much to the frustration of the casual Boxing fan. Another factor threatening the popularity of Boxing is the continued emergence of Mixed Martial Arts into the mainstream. The UFC has been particularly successful in recent years, with attendances, television money and general media attention continuing to grow. The likes of Anderson Silva and Junior Dos Santos have proven themselves to have outstanding Boxing abilities, while the fast pace and diversity of styles and techniques on offer in MMA offers fans of combat sports a genuine alternative to Boxing. This has left those at the top concerned about a drain of fans, finance and fighters in the near future. These factors contributed to this being the most important weekend Boxing has seen in years. Much has been made of the $41.5m that Mayweather received for the fight, but he is the biggest draw in Boxing at the moment. The fight is expected to have generated $100m via pay per view customers, on top of $20m collected from ticket sales, the biggest gate receipt in the sport’s history. Equally important is Mayweather’s status across the globe. As Las Vegas more often than not plays host to these landmark fights, the casinos crave fights that will attract foreign spectators to Nevada as spectators, and more importantly gamblers. Taking all of this into account, Mayweather took to the ring last night with the world of Boxing on his shoulders. Mayweather exemplifies the best and worst aspects of boxing, and this was all on display last night. After the modest and traditional entrance of the humble and likeable Alvarez, Floyd “Money” Mayweather arrived in all his ludicrous decadence. 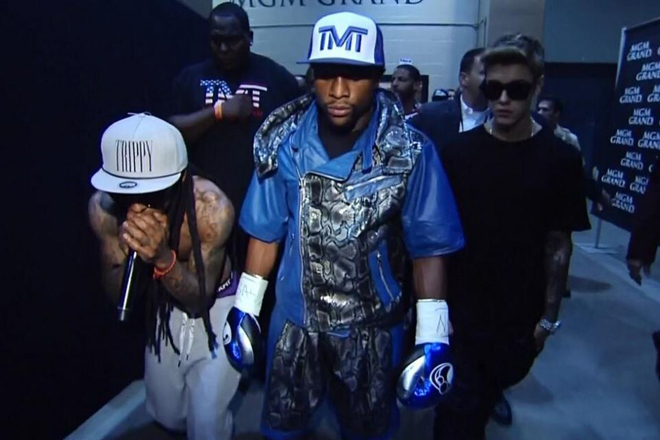 Chaperoned to the ring by rapper Lil Wayne and pop star Justin Bieber, the scene was truly bizarre. Boxers are often flamboyant showmen by nature, but at times like this, you can’t help but feel that Mayweather at times creates a sideshow that detracts from the real spectacle: the fight. 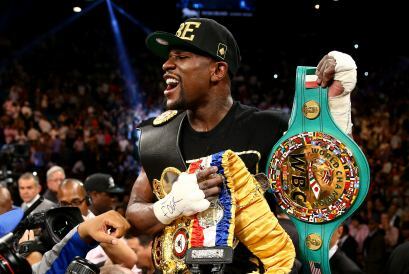 Mayweather is candid about his motivation for fighting, and it’s all about the money for him. This vulgarity can make him harder to like, and undoubtedly creates a disconnect between Mayweather and the majority of blue collar Boxing fans, but his talent is undeniable. When the fight itself finally got underway, Mayweather stepped immediately on to the front foot attempting to get close to Alvarez. The young Mexican with an outstanding record had the experience of 43 professional fights but not many of this magnitude. It was only Alvarez 4th fight at the fabled MGM Grand, while Mayweather was making his 11th appearance at that venue and his 8th consecutive. Mayweather determined to test Alvarez nerve, probed and reached with his dominant right hand. Canelo impressed though, showing great composure in not biting on Mayweather’s early fakes and feints. In the 2nd, Alvarez had some minor success finding his way through to Mayweather’s body with a solid combination. Floyd showed his willingness to bide his time though, as he let Alvarez initiate before landing strong, short counter punches in response to the Mexican’s left hooks. In the 3rd, both men exchanged jabs, with Mayweather landing a solid combination. The fight finally opened up a bit in the 4th, giving everyone a reminder of why it was so hotly anticipated. Both fighters exchanged solid punches. Mayweather probably edging the exchange, fell victim to a low blow from Alvarez that he wouldn’t forget too easily. As the bell approached, both men opened up landing good shots to the head and body. As the 5th round arrived, it was particularly apparent that Mayweather was standing firm and going toe to toe, contrary to his regular tendencies. Before the 6th, Alvarez corner told him it was time to start winning rounds, resulting in the Mexican upping the pace. Not for the first time over the years though, Mayweather showed impressive half guard defense to keep him at bay. 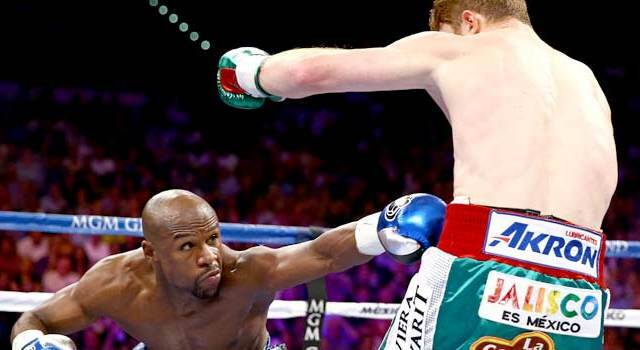 Showing the first signs of frustration, Canelo shoulder bumped Mayweather’s head as the bell neared. The 7th round was significant as Alvarez punches began to hit their target significantly less. Alvarez tried to lure Mayweather in to give an opportunity to counter punch, but Mayweather managed to jab Canelo back into the corner. This marked the first true spell of offensive dominance from either man as Mayweather landed a strong uppercut and kept his opponent pinned in the corner for the guts of a minute. For the round, Mayweather landed 50% of his punches versus 24% for Alvarez. In the 8th, Canelo twice managed to work Mayweather on to the ropes having landed strong body shots, but on both occasions Mayweather managed to roll away and land a strong counter. The pattern of Mayweather control continued when he snapped back Alvarez jaw with a strong right hand in the 9th. Alvarez on the other hand continued to miss, throwing wild hooks. At the beginning of the 10th, Alvarez landed a strong right to Mayweather’s head, but Floyd rolled with it completely unfazed. Mayweather was by now throwing pop shots with astonishing frequency, jabbing consistently near the ropes. Once again Saul Alvarez managed to force Mayweather onto the ropes, this time blitzing his body, before Floyd rolled away again. From that point on Alvarez began to swing more and more wildly, allowing Mayweather to comfortably dance his way through to the final bell. The judges decision was controversially split, meaning that Mayweather would have to settle for a majority decision victory. Mayweather has earmarked Alvarez as the man to take his place at the top of the sport after he retires. While Floyd is still here though, Boxing is safe. 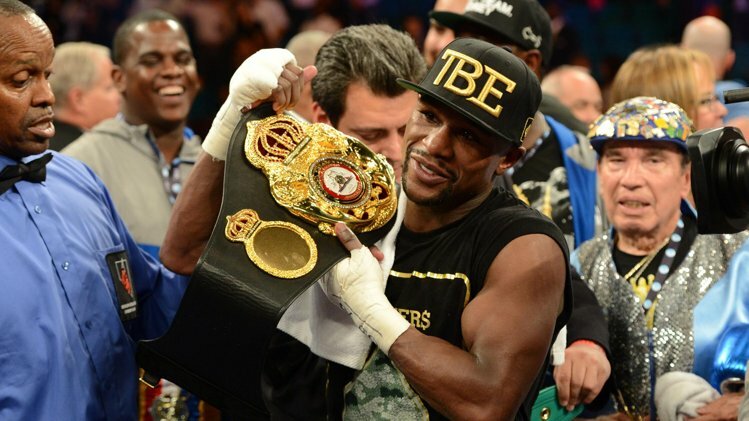 Last night was another example of Mayweather’s outstanding technical abilities. His fast hands, footwork and general fighting intelligence are too much for anyone to handle still at the ripe old age of 36. Is he the best ever? That could be argued forever, one thing’s for sure though, he’s firmly in the conversation. I think it’s safe to say the best ever! Thanks for the link to this, really enjoyed reading it. Particularly liked how you interspersed the pictures. Interesting point about the UFC there. I think their success shows without a doubt there is a big global market for competitive fights. What they have is one champion in each weight class and one official set of rankings. I can’t see boxing getting back to that given all the sanctioning bodies, which is frustrating because imagine entertaining it would be if it were run like the UFC. Thanks. It would be great if Boxing could go that way, with all the red tape at the top of the sport though, it seems like it’s almost impossible. Thanks for the comment on my post and the link, very interesting stuff. I think a UFC type model would suit boxing and help its growth, however I can’t see how the sport would ever get there at this moment. Thanks. Yeah I agree completely. It’s the way forward, but unlikely to ever happen.